The Companion Card is a registered trade mark owned by the State of Victoria. 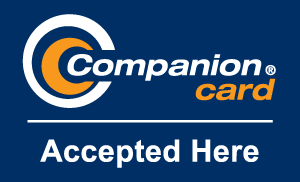 Businesses that have formally affiliated with the Companion Card program agree to display the Companion Card logo in a prominent position at their business premises or ticketing outlet and in promotional material, where possible. These files can be used on websites, documents (eg. Word) or other screen-based media.